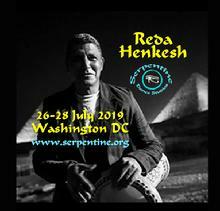 Washington DC Welcomes REDA HENKESH in his first ever USA workshop! Watch out, it’s impossible to sit still at a Reda Henkesh concert! Audiences have even been seen twerking in their seats. Not surprising, since this master percussionist has spent over 45 years playing with and for Cairo’s best; Nagwa Fouad, Shoo Shoo Amin, Mona as-Said, Wadia al-Safi, Ahmed Adawia, Hany Shaker and Mohamed al-Helou are only a few. The 5th son of Cairo’s Golden Era band sensation Reyes Henkesh, he followed his father into the music profession - at age six - as did his older brothers Sayed, the legendary Khamis and Ramadan. And with Khamis’s recent passing, Reda is now considered his brother’s percussive heir. 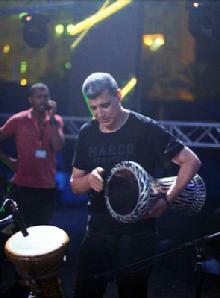 Reda is also known as a master tabla (darbouka) instructor, rhythm guru and belly dance drummer. Don’t miss this unique opportunity to study with one of the greats! Most belly dancers are familiar with “The 3 M’s” - maqsoum, masmoudi and malfouf. But do you know any others, like sama3i, bambi, zorofat, sinbati, wahda or fellahi? You will after this class! Specialty beats show up in Middle Eastern music like dew in the morning, embellishing the landscape, from classic Om Kalthoum masterpieces to modern mergence. Enrich your dance vocabulary, and avoid being caught off-guard by rhythms you’ve never heard. Are you curious about Egyptian sagat technique, or ever been to a drum circle and didn’t know how to participate? Or wanted to play for your troupe to add a live element to your performances, but didn’t know where to begin? 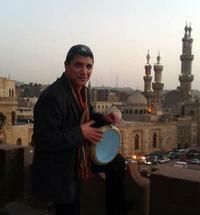 Reda will teach the basics of Egyptian finger cymbals and hand drums. Bring instruments if you have them! In this workshop, Reda will teach the basic structure of a drum solo and many of the common “riffs,” or patterns, drummers string together. In addition, he will break down how to transition from one riff to the next and the principle of organized repetition on each side. He will also demonstrate his signature solos and how he goes about creating new ones. How do you know what a drummer is going to do next in an improvised solo? There are tricks of the trade that Reda will teach! How to signal the drummer, how to anticipate a transition, how to take the lead and have the drummer follow you … A secret language communicated without words. And then each participant will have a chance to dance with Reda and apply what you have learned. THE STUDIO ONLY HOLDS A MAXIMUM OF 25 dancers, or 40 for the seated percussion lessons, so sign up early to ensure a place. Priority is given to full workshop attendees. Individual classes will only be available after May 31st, when the Early-Bird special is over - providing there is still room. Payment plans are available. Please contact us ( info at serpentine.org) for details. 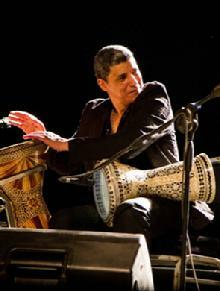 Reda will also be available to teach tabla/darbouka classes Wednesday and Thursday evening, July 24 and 25, if there is a demand, and a limited number of private lessons for anything percussive, including tabla, riq, tar, duff, dahoula and sagat. Please contact info at serpentine.org if you are interested. ALL CLASSES AND EVENTS TO BE HELD AT SERPENTINE DANCE STUDIO.